Linda’s Teaching Session is no longer active. If you missed this Linda’s teaching session or would like to hear it again, the 2016 Tele Summit is available for purchase here. Linda Kohanov is an internationally-recognized author, speaker, riding instructor and horse trainer. 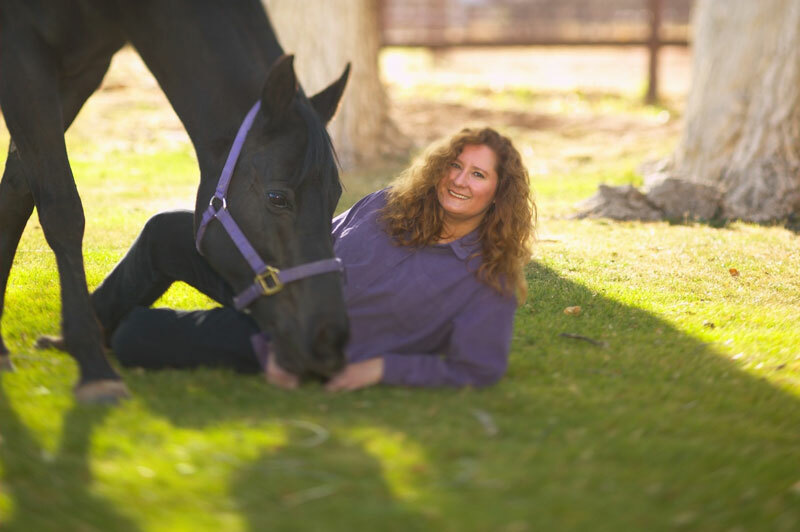 In 1997, she founded an Arizona-based collective of horse professionals, educators, coaches and counselors exploring the potential of the horse-human bond, an organization that has grown to serve clients on five continents. Her first bestselling book The Tao of Equus was selected as one of the top books of 2001 by Amazon.com and has received appreciative reviews in publications as diverse as Horse and Rider, Natural Horse, IONS Noetic Sciences Review, Spirituality and Health, and Strides. Her second book Riding Between the Worlds: Expanding Our Potential through the Way of the Horse was published in November 2003, and also received excellent reviews. Linda’s books have been translated into French, German, Dutch, and Czech, and are used as texts at universities. In 2007, Way of the Horse: Equine Archetypes for Self Discovery, a collaboration with artist Kim McElroy, was published, taking “horse wisdom” into the home, the workplace, schools, and other human environments, offering equine-inspired insights on relationship, leadership, non-verbal communication, creativity, power, authenticity, and balance. In 2013, Kohanov’s fourth book The Power of the Herd: A Nonpredatory Approach to Social Intelligence, Leadership and Innovation explored what horses have to teach us about leadership and social intelligence, with extensive historical and scientific research showing why the world’s most innovative and effective leaders, from Alexander the Great to the Buddha to George Washington and Winston Churchill, were exceptional horsemen who honed the nonverbal skills associated with leadership presence on horseback. The book also translates the practical skills horses teach directly to use at work, school, church, and political and social activism contexts. It has already been translated into Dutch and French. Linda is currently working on a new book The Five Roles of a Master Herder: A Revolutionary Model of Socially Intelligent Leadership, which will be released in June of 2016. Over the last decade, Linda has appeared at numerous conferences, universities and retreat centers, including the 2008 Organization Development Conference, the Omega Institute in New York, Naropa University in Boulder, CO, the University of Arizona, Prescott College, the 2005 International Transpersonal Conference, Hollyhock British Columbia, the 2003 North American Riding for the Handicapped Conference, and the 2008 Equine Guided Education Conference, among many other venues. She has been a leadership trainer at Raytheon Missile Systems since 2007, and has also led trainings for executive teams at Nike, Chubb Insurance, and the Bensman Group of financial advisors, among other companies. Kohanov’s seminars attract business leaders, entrepreneurs, educators , scientists, mental health professionals, artists, spiritual leaders, and activists from six continents. At the Eponaquest Center in Amado, Arizona, Linda developed innovative, highly effective approaches to leadership training and team building that have been embraced by executive coaches, sales managers, and major players in the aerospace industry. Since 1997, Linda has trained thousands of people from around the world. The demand for seminars became so great that, starting in 2002, she began training instructors capable of leading their own seminars in the Eponaquest Approach. Currently over 200 Eponaquest Instructors from five continents have graduated from this highly successful, year-long apprenticeship program. For more information go to Eponaquest.